Give your new belly dance costume an attractive finished look by making a pair of beaded earrings to match your bra and belt. Achieve the look of being in costume from head to toe. Delight the other members of your troupe by making earrings for them that match their troupe costumes. All it takes is a few inexpensive bugle beads and seed or rocaille beads, strong beading thread, thin beading needle, and scissors. These instructions describe how to make a pair of simple beaded earrings like the pair pictured here. Included is a brief explanation of the supplies used for such a project, plus some suggestions for variations you can try after finishing your first pair. 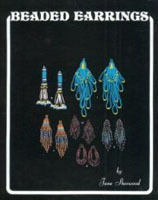 At the end of this article is a list of instruction books offering designs for other styles of beaded earrings. If you enjoyed making the ones here, you'll enjoy the many ideas that they offer for additional projects. It takes someone who is experienced at making this type of earrings about 35 minutes per earring to make these. As a novice earring maker, you can expect to take a while longer, but after you've made a few pairs, you'll find that they go together quickly! These supplies are common and easy to find in craft stores like Michael's, or the craft department of a major fabric store. If you live in a rural area that doesn't have such stores available, there are many craft mail-order places on the Internet that sell these supplies. 28 size 2 gold bugle beads. Size 2 bugle beads are about 3/16 inch (4 millimeters) long. Bugle beads are long glass tubes. 14 size 5 gold bugle beads. Size 5 bugle beads are about 3/8 inch (1 centimeter) long. 6 gold rocaille beads, size 10 or 11. Rocaille beads are glass or plastic beads that have a shiny silver lining. Seed beads may be substituted instead. If you're new to beading, you may find size 10 easier to work with than size 11, because it's slightly larger in size. 198 red rocaille beads, size 10 or 11. Seed beads may be substituted instead. Nymo, size 0. This is the special nylon thread sold specifically for beading. Beading needle. This is a special long, very thin needle especially used for beading. Pair of gold kidney wires. The first step is to make the foundation row. This is the row of bugle beads that will anchor everything else in the completed earrings. The stitch used to make the foundation row is called the ladder stitch. Cut a piece of the nymo thread about 60 inches (152 centimeters) long. Thread it through the beading needle. Thread two of the bugle beads onto the needle. Leave a tail at the end of the thread about 4 inches (10 centimeters) long. Hold the two bugle beads side-by-side. Thread the needle back through the first bead that was threaded, entering at point 1 and exiting at point 2 as shown in this diagram. Thread the needle again through the second bead that was strung, entering at point 3 and exiting and point 4. Pull the thread taut so that the two bugle beads are held in place snugly against each other. Click on the image to the right to see the drawing in more detail. Thread a third bugle bead onto the needle. Thread the needle through the second bead you had added, entering again at point 3 as shown in the above diagram and exiting again at point 4. Bring it a second time through the third bead, entering at point 5 and exiting at point 6 as shown in the diagram to the right. Pull the thread taut so that the bugle beads are held snugly next to each other. Thread a fourth bead through the needle. Bring the needle through the third bead another time, entering again at point 5 and exiting again at point 6. Thread it through the fourth bead, entering at point 7 and exiting at point 8. Pull the thread taut so that the bugle beads are held snugly against each other. Continue like this until you have a row of 7 bugle beads snugly nestled against one another. To complete the foundation row, thread the needle back through each bugle bead once again as shown by the dotted line in the diagram, to give added strength and reinforcement to the row of beads. Go all the way to the beginning, until you have passed the needle through the starting bead a final time. Pull the thread taut so the bugle beads are held snugly against each other. The header is the top of the earrings. It's the next thing you make after completing the foundation row. The stitch used to make the header is the brick stitch or Comanche stitch. Thread two red rocaille beads onto the needle, and draw them down next to the foundation row. Place the needle so that it passes under the threads connecting the tops of beads 2 and 3, between the two beads. Draw it all the way through, and pull the thread taut. Click on the image to the right to see the illustration in greater detail. Pass the needle upward through the bottom of the second red rocaille bead that was strung and pull the thread through. Note the close-up detail in the diagram to the right. Click on the image to the right to see the diagram in greater detail. Thread one gold rocaille bead onto the needle, and attach it under the thread that joins beads 3 and 4. Add one more gold rocaille, then two red rocailles. There will be a total of 6 beads on this row: 2 red on each end, and 2 gold in the middle. Thread one red, then one gold rocaille bead onto the needle, and attach the same way you attached the first two beads on row 1. Attach a red rocaille, followed by a gold rocaille, then one more red. You will end up with a total of 5 beads on this row, alternating between red and gold. For Rows 3 Through 5, continue adding rows of rocaille beads, following the colors shown on the chart to the right. String 4 red rocaille beads onto the needle. Bring the needle down through the other bead on row 5. For added strength, bring the needle back up again through the first bead on row 5, through all 4 "hanger" beads, and down through the second bead on row 5. Note the path that the dotted line takes in the diagram. You have completed the header. It's time to make the dangles, which are the fringe that hangs down from the foundation row. Run the needle down through the holes of the rocaille beads along the side of the header, and out through the bugle bead below them in the foundation row. String 3 red rocaille beads, then 1 size 2 gold bugle bead, then 3 more red rocaille beads, then 1 size 5 bugle bead, then 3 rocaille beads all onto the thread. Next, run the needle back through the size 5 bugle bead, then all the rocaille beads and bugle above it. Run it back through the bead at the top of the foundation row, then down through the adjacent bead on the foundation row. The three rocaille beads at the bottom of the dangle will form a little triangular fleurette. Pull the thread taut so that there is no bare thread between the foundation row bugle bead and the first rocaille, but don't pull it too tight or the fringe won't dangle properly. String the remaining fringe. For each column, come down through the foundation row bugle bead, string the rocailles and bugle beads, come back up through them, and back up through the foundation row. The second column of fringe will have 4 red rocaille beads, then a gold size 2 bugle bead, then 4 more rocaille, a size 5 bugle bead, and 3 rocaille beads for the bottom fleurette. Each column adds 2 more rocailles, one on each side of the size 2 bugle bead, until you reach the center column, which is the longest. From there, reduce by 2 rocaille beads, one on each side of the size 2 bugle bead, until you reach the other end. After coming back up through the final foundation row bugle bead, run the needle up through three of the rocaille beads along the edge. Tie a knot around the thread that lies between rows 3 and 4 to anchor it, and finally run the thread back down through some of the other rocaille beads. Cut the thread off close to the beads so that the tail isn't visible. Thread the starting tail of thread through the needle. Draw it up through the bugle bead on the foundation row next to it, and through some of the rocaille beads in the header. Cut the thread off close to the beads so that the tail isn't visible. Place the hanging loop on a kidney wire. The first earring is now complete. Make a second earring to match it. One variation is to make the earrings either larger or smaller. This illustration is based on the basic design described in the instructions above, but it shows a foundation row that uses 9 bugle beads instead of 7. 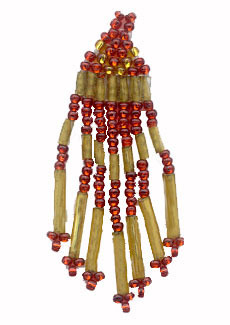 The fringe is also longer, using about twice as many beads as the design above. If you're planning to make earrings to sell, then you'll want to charge more if you make the larger ones. Important Note: Beware of using seed beads in the colors fuschia and royal purple. The dyes used to make these beads can react with some people's skin chemistry and rub off the bead. It is best to wash one's hands frequently to remove natural skin oil when making beads in these colors, and avoid wearing the earrings when perspiring heavily. As shown in the variation designs above, it's possible to achieve a different look by using only one rocaille bead at the bottom of each dangle, instead of the triple-bead fleurette described in the instructions. To the right, is another very simple variation on the basic pattern. Instead of forming a "V" shape, the fringe is slanted, and the slant is echoed in the arrangement of colors in the header. This earring is made entirely with rocaille (or seed) beads and size 2 bugle beads. You can make it slightly larger by making a foundation row of 9 beads. The foundation row is 7 bugle beads. This is a good design to use if you want to incorporate three colors in your finished earring. The design to the right uses red, green, and gold, which would suit a Christmas performance. You could also combine red, blue, and silver for an appealing look. Or, try the autumn colors of red, gold, and coppery brown. To the right are two more designs for variations on the beaded earrings. In the design on the left side of this diagram, size 2 bugle beads are used for the foundation row, but the fringe uses bugle beads that are 1 inch (or 25 mm) in length. For added pizzazz, look for a bead shop that sells the 1-inch or 25-mm bugle beads that have a twist to them. The design to the right shows how size 2 bugle beads can be used for the entire header (except, of course, the hanger). This gives an elongated look to the header which makes for an interesting variation. Use a heavier beading thread for this pair, because the sharp edges of bugle beads can cut a lightweight beading thread when making the header. The fringe for this pair uses an inverted "V" shape, and is composed primarily of bugle beads with just a small number of rocaille beads for contrast. For a Christmas tree look, make the header out of green bugle beads, the hanger out of gold, and omit the fringe. Dancers will particularly enjoy the Eye Of Horus (utchat) and Bikini Girl (who looks like she could be a belly dancer). Other designs in the book include a macaw, donkey, kabuki mask, fox, woodpecker, rearing horse, peony, tiger, eagle kachina dancer, happy moon, red-tail hawk, alaska landscape, hot air balloon, shepherdess and sheep, fuschia, turtle, geranium, rainbow with pot of gold, rockhopper penguin, Marilyn Monroe, kool kat, wolf, egret, fire serpent, poppy, Japanese crane, hummingbird, and terrier. These unique designs are very different from most patterns for beaded earrings. 6 different designs. Focused on the non-picture style of beaded earrings, through use of creative ways to make the header and the fringe. Instructions for 81 different patterns. A few picture bead styles (Santa Claus, flag, elf). In addition to several designs featuring the brick stitch header (like the earrings on this page), this book shows how to make earrings with star-shaped and lacy headers. 52 different patterns. Once you've mastered the simple brick stitch earrings (the pattern on this page), this book will expand your horizons to several new beaded earring techniques. It offers a few picture beading patterns, including a Pegasus, some stars, a rainbow, a desert scene, a feather, snowflakes, a heart, and a daisy. It goes on to show how to make a beaded wrapper for a crystal, how to do the flat woven style without a loom, and how to do the peyote stitch. Over 60 patterns in all.